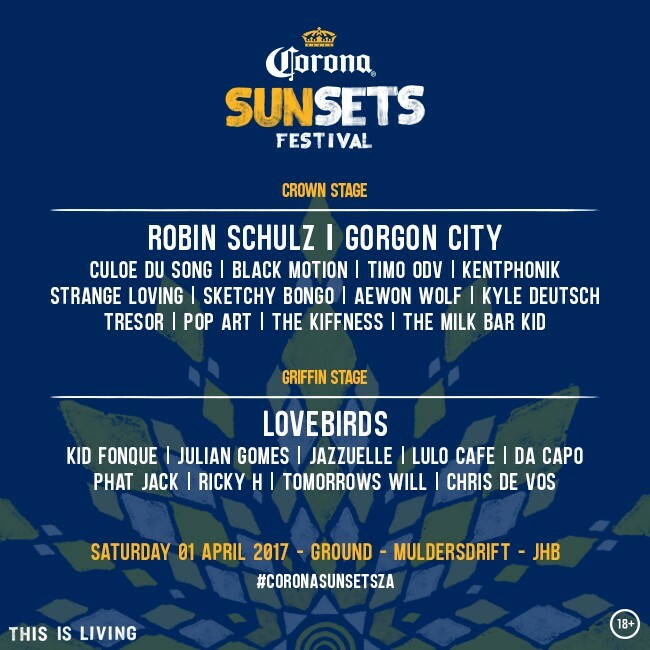 Corona SunSets Festival Brings the Magic to Jo’burg! Corona SunSets features more than eight flagship festivals and close to 4,000 events of various size and intimacy worldwide, celebrating the exhilarating transformation that takes place around the world at sunset. Gear up Jo’burg, Corona is about to bring you the sexiest and smoothest of festivals! Hot on the heels of the Cape Town edition, Corona SunSets is set to bring its magic to Johannesburg on Saturday, 1st of April 2017 at Ground, Muldersdrift. Jo’burg may not have an ocean view, but nothing beats a gorgeous sunset, and ocean or not, this particular sunset is guaranteed to be one for the books. Add some of the world’s freshest music, in a venue that’s hard to beat, and you have a festival that will be host to the who’s who of Jozi’s urban culture. As with all Corona festivals around the world, this event will feature two dance floors, The Crown and Griffin Stages, each with its own unique and scintillating lineup. Follow #CoronaSunSetsZA for more information. STRICTLY NO UNDER 18’s ALLOWED, AND ALL ATTENDEES WILL REQUIRE IDENTIFICATION TO ENTER THE EVENT – ONLY ORIGINAL ID BOOK/CARD, DRIVERS LICENCE CARD OR PASSPORTS WILL BE ACCEPTED. Born in Mexico and brought up on the beach, Corona is the leading beer brand in Mexico, the 6th most valuable beer brand in the world*, and the most popular Mexican beer worldwide, with sales in more than 120 countries. Corona Extra was first brewed in 1925 at the Cervecería Modelo in Mexico City. Corona is the perfect complement to life’s simple pleasures. The golden color, light refreshing flavor and iconic hand painted bottle, topped off with a freshly squeezed lime. Heineken® Shines The Spotlight On Cape Town With #ShapeYourCity Experience!